Today I am so excited to post my first recipe here !! 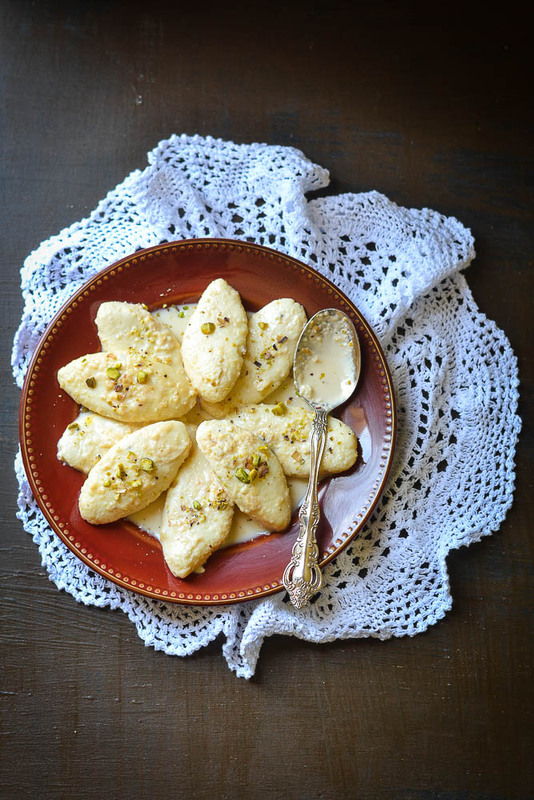 Starting with a sweet dish which we all Bengali love to make and taste. This one is called "Malai Chomchom", very close to another legendary Bengali sweet "rasmalai" :-) Though there is little difference in shape and texture. Both are equally mouth-watering. For last couple of years, I was uploading pictures of my different dishes into Facebook and I feel fortunate that my friends used to appreciate them a lot. This particular one was passed to many of friends. Since there was no plan for blogging at that time, didn't take step-by-step pictures of the entire cooking process for this recipe. 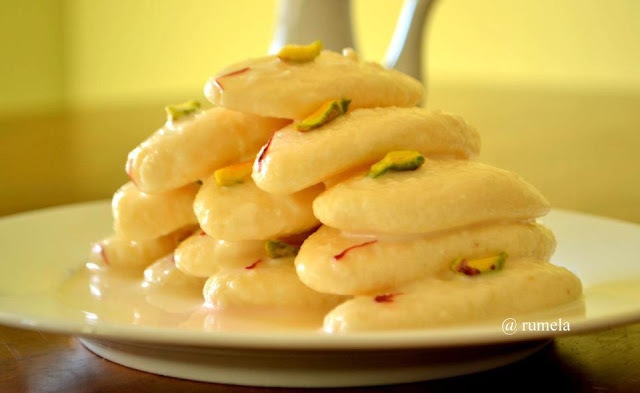 Hope detailed description below would be good enough for you to make this wonderful sweet. 1. Milk - 1 and half liter of whole milk. 2. Leave the chhana / cottage cheese in this condition for 5-7 mins. 4. Now put this cloth with the chhana under cold running water for 2-3 minutes. This will help to remove the smell of lemon. 7. Now put the lump of chhana over flat surface. Add 1/2 tsp sooji, 1 tablespoon flour, 1 tablespoon sugar into it. Knead them nicely together. Press the dough with your palm continuously for about 3-4 minutes. Once you feel dough is oily then you are done. 8. Now from this dough, make 12-16 balls. First make them into round shape and then give them cylinder shape. Then press them to flatten it. You will get that oval or chomchom shape . 9. Take a pan with lid. Put the water and sugar to boil for some time. After 5 minutes, place the chomchom into the syrup carefully. Cover it. Turn your stove on to a medium heat. Let it cook for some time. 10. After 25 minutes, open the lid to check. The chomchoms will be about one and half times of their original size and become spongy too. 11. Turn off the gas. Now remove the chomchom from the syrup. 12. In another pan, take the 2 cups of full cream milk. Boil the milk. When it starts boiling after few minutes turn the gas off. Cool it outside or put it into the refrigerator. Now take the cream off (“dudher swar”) from the milk and put it in a bowl. Continue the process (boiling the milk, cooling it down, removing the cream from cooled boiled milk ) for 4 to 5 times. 13. Take the removed cream in a blender. Add 1 tsp of sugar into it. 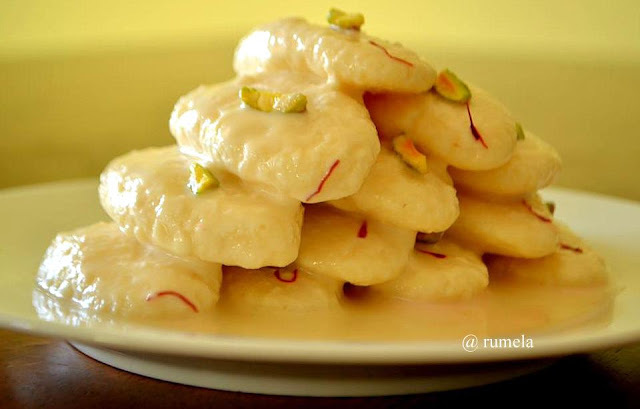 Make a smooth paste of malai. Add this malai to the remaining milk. Soak few strands of saffron in 2 tsp of warm milk. 14. Turn the gas down to simmer. Make the malai and milk mixture hot. Add 1 tsp of sugar. Add the chomchoms. (when you put the chomchoms, drain the extra syrup out). Let the chomchoms soak for about 10-15 minutes. 15. Wow, Malai ChomChom is ready !! You can put them into the refrigerator overnight. Or get the chomchoms out from the malai, put them on the serving plate. Then pour the cream and saffron mixture over the chomchoms and garnish with some sliced pistachios. 16. Generally you can see all the sweet shops sell malai chomchom garnished with some Khoya but I like it without khoya. Serve it cold. 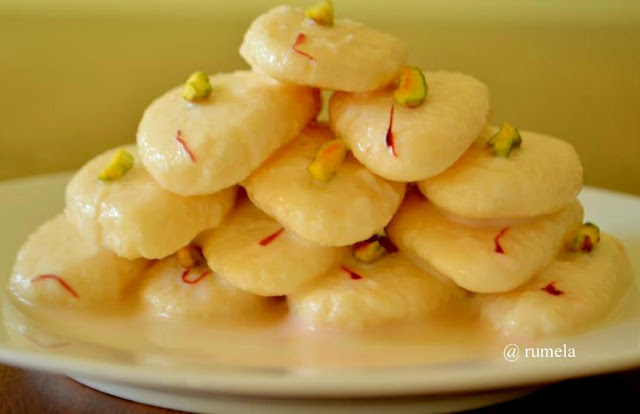 Happy Cooking and enjoy malai chomchom!! Note : you can store it maximum 2 to 3 days, preferably in refrigerator.